Are you familiar with induction dice, or radio wave dice? This magical dice is installed with an micro radio wave and a small battery, which is a good gambling tool for you. This radio dice helps you know the exact point of the dice through a vibration receiver. According to different length of radio wave, the receiver will have different vibrations, which helps you to know the number of dice easily. 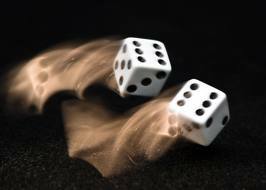 Induction dice has the function of interact differently with every side of the dice. It can accurately tell apart which point is the dice.